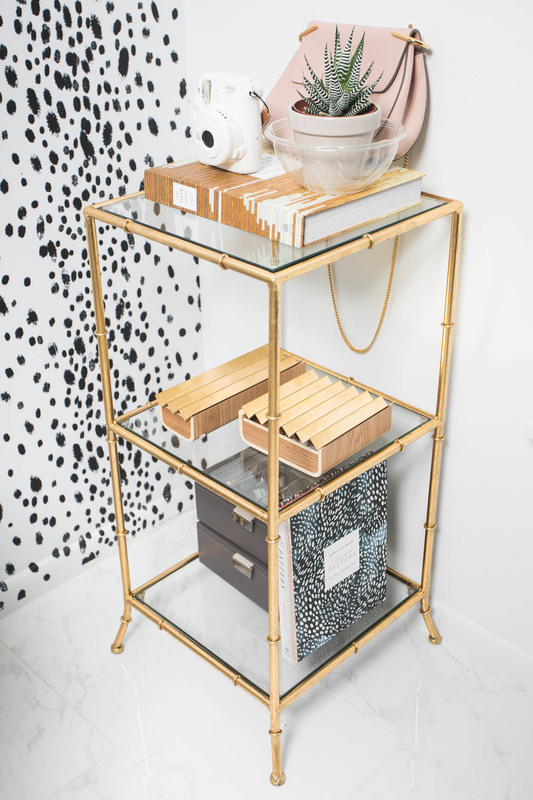 As I mentioned in my sneak peak office post featuring Lulu & Georgia, it’s all in those details. 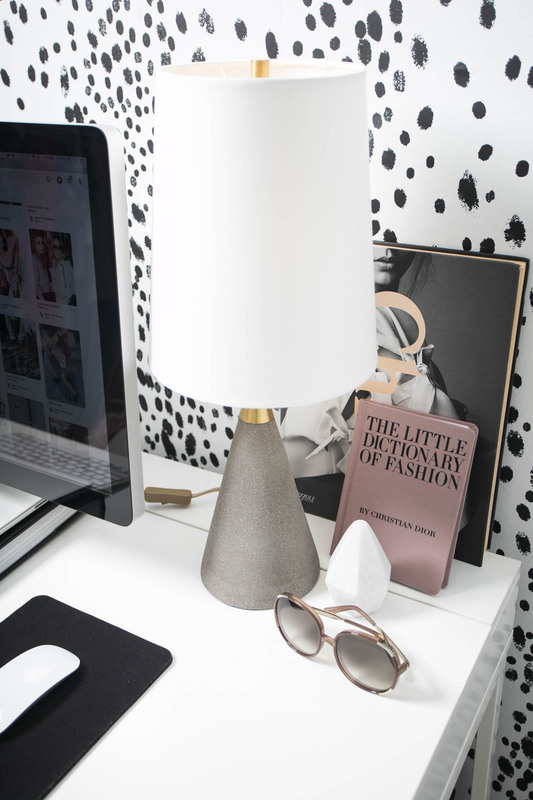 When I was dreaming up this office space on Pinterest, I was headed for contemporary-chic vibes. Add in some southwestern-inspired touches, and some girly ones too (hence the polka dot wall – you can’t miss it! ); embellish it with greenery, pops of retro and gold … and voila. When it comes to decorating styles, I seem to change what I love weekly (..oops) but right now I’m darling to mixing unique styles together. I thought I’d use this post to round up some decorating tips below! Pinterest secret boards are personal interior designers: When you start working on home spaces, make a secret Pinterest board so you can visualize how everything blends in one place! This also gives you a way to save all your favorite pieces in one spot and being able to visit them again if you decide to bite the bullet and go for it. This also gives you inspiration to reference to (on your smartphone (download the Pinterest app)) if you happen to be browsing for pieces in store. I play around with deleting pins from the design board, and adding them back in — seeing how swapping in and out certain items changes the room vibe. I don’t know about y’all, but it takes me weeks to plan out home spaces! Greenery, yes please! : There’s something about adding greenery embellishments, succulents, and plants that adds such a blissful and peaceful feeling to any room. The large plant in the basket is called Sansevieria (or more commonly Mother-in-Law’s Tongue!). If you don’t want too many plants to take care of (gotta give my brother credit here — he waters our office plants!) then go for greenery prints. Find my favorite here and here (cheaper than plants!). Container Store works wonders: Okay here comes the OCD girl inside me: After 6 years of retail, I learned a few things about keeping things pristinely clean (where my retail girls at?). With that, I’ve managed to learn the behavior of finding everything a home. 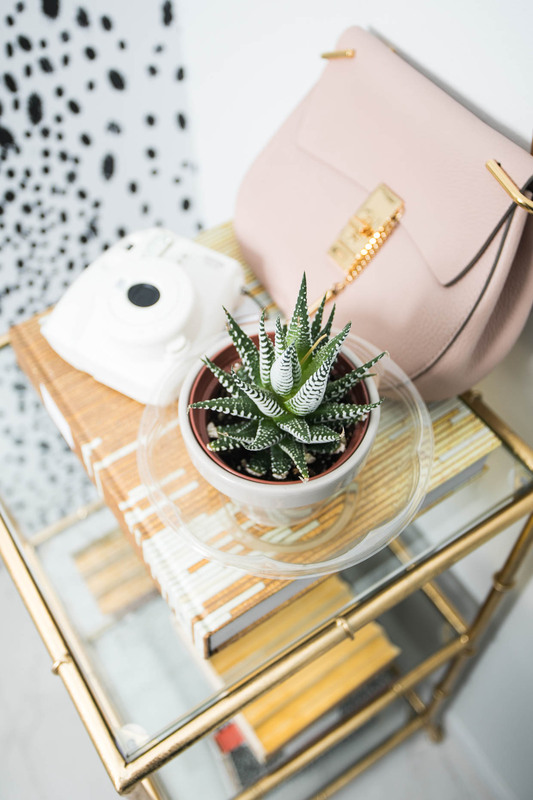 I keep my jewelry in these chic gold containers (obsessed – you have to try these!) and my sunglasses in these containers. Mix textures: I love mixing different textures (mongolian fur, velvet cushions, gold chairs, basket weaves, etc.) to add depth and contrast to the room. Since I love white so much, it’s important to add pops of color and texture so the room doesn’t feel too sterile. 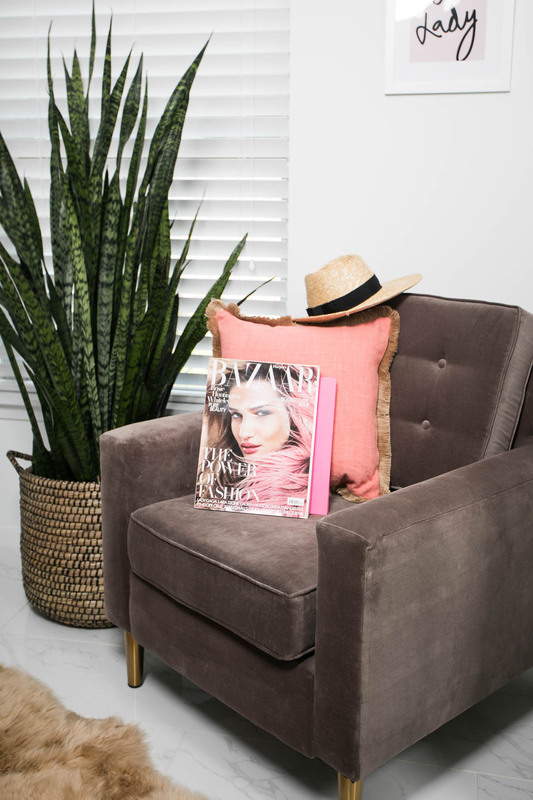 Coffee table books: Instead of buying expensive objects to dress up a dresser or desk space, I love embellishing flat surfaces with coffee table books (Amazon is my go-to for these). 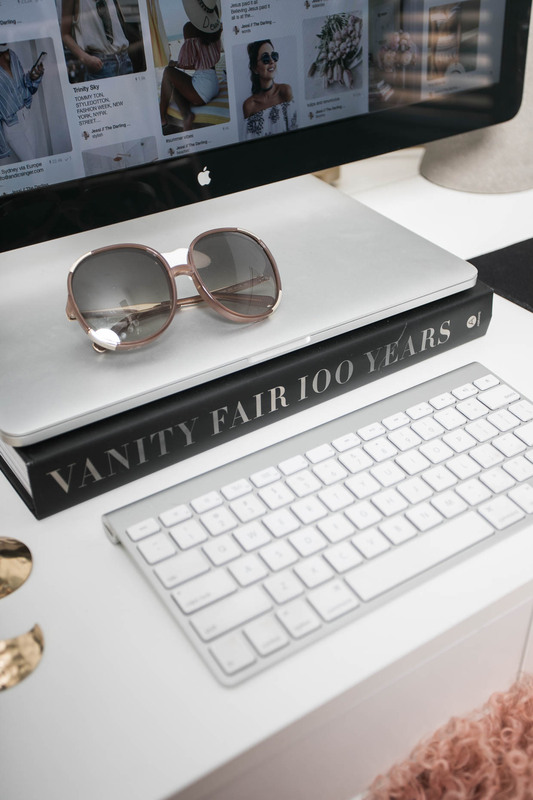 Find my spotted book here, gold book here, The Little Dictionary of Fashion pink book here, Chloe Attitudes, and Vanity Fair book here. Simplicity is key: Since I do change my mind so often, I like to keep things simple — easily and simply changeable in case I do decide to switch things up every so often. That’s another great reason to keep a smaller budget for re-design projects like this one! Amazing pictures and such a lovely details!! Yasss please do ALL the interior design posts!!! Girl, for real? 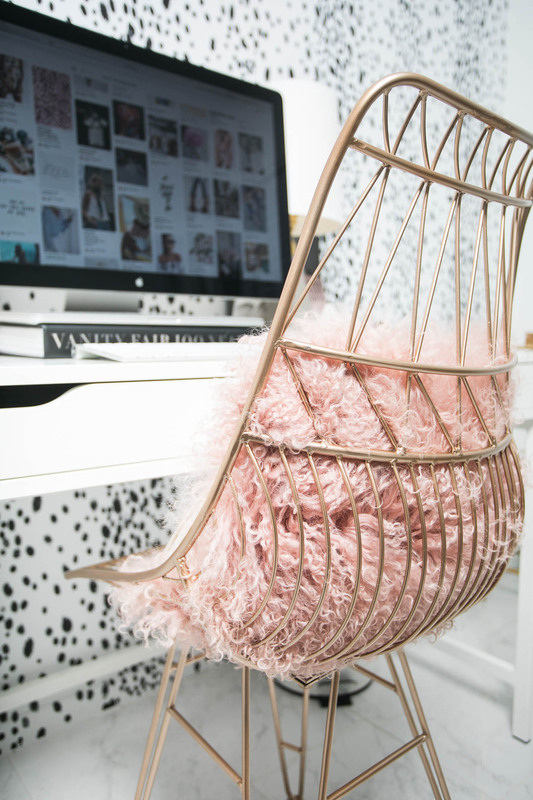 This office space is SO inspiring and swoon worthy!! Eep! I love it!! Love your space! Pinterest secret boards are the best. We are about to move, and I know I need to check out the container store! Your office is seriously the cutest! Love the wallpaper and the pops of pink! Holy moly! You have yourself a pretty rad office. I really love the wallpaper and the bamboo shelf. I also love the pants you’re wearing in this post! Where is your wallpaper print from? Love it!